BBC NEWS | UK | UK Politics | Election 2005 | Which party is winning the air war? There comes a time in every election campaign when the really big question has to be asked. Never mind the parties' policies on tax and spending, or health and education, does anyone know who has the best helicopter? Labour and the Conservatives have ditched the traditional leaders' battle bus altogether in favour of aerial transport, in a bid to cover as many campaigning miles as possible. But if you had to pit the two parties' aircraft against each other - in time-honoured Top Trumps style - there would not, so far, be much to choose between them. 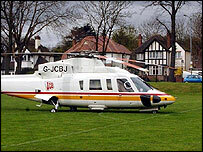 On the first full day of campaigning, Mr Blair and Mr Howard both opted for virtually identical helicopters - variations on the Sikorsky S-76, which is also used by the Royal Family. Mr Howard opted for the more modern S-76C, while Mr Blair was in the older, but more powerful S-76B. Both have roughly the same top speeds and range. Peter Donaldson, technical editor of Defence Helicopter, describes the Sikorsky as "a well-proven, twin-turbine engined helicopter used in everything from ferrying oil workers out to rigs, to emergency medical work, to carting Her Majesty the Queen around". The cost of hiring an eight-seater S-76 is about £2,300 per flying hour, although the logo and registration number of the Conservative aircraft suggest it could be on loan from party donor JCB. 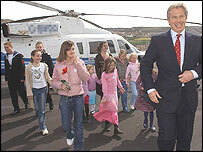 The two leaders will be stepping up to 16 seat helicopters next week - probably a Eurocopter Super Puma, of the type pressed into service by Mr Blair in February for the launch of Labour's pledge card. Charles Kennedy, who has chosen fixed wing aircraft over helicopters, beats both party leaders for top speed and range, if not manoeuvrability and convenience. But the Liberal Democrat leader's choice of transport has landed him in hot water with environmental campaigners. He will be relying on a battle bus to cover much of his planned 2,000 mile trip around the UK. But his decision to get his campaign off to its traditional "flying start" in a six seat Cessna Citation led to criticism he was damaging the environment. The party has been at the forefront of calls for curbs on carbon emissions from aircraft. 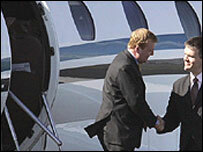 A wounded Mr Kennedy pointed out that his plane was "carbon neutral". This means that whatever it gives off in the way of carbon emissions will be compensated for by the planting of a suitable number of trees. The party could be in for a bit more digging than it bargained for, however, as its choice of plane for the rest of the campaign is a 46-seat ATR 42-300 turboprop. Mr Kennedy is also reported to have a helicopter or a plane on stand-by to rush him to his wife's bedside when she goes into labour with their first child.